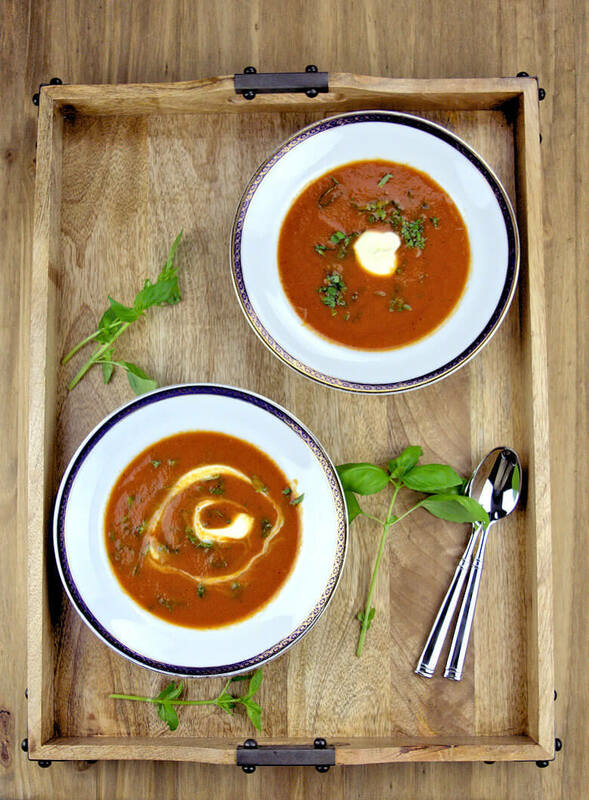 This Fresh Summer Tomato Soup may be the single soup recipe that only needs 1 major ingredients to taste absolutely delicious. This ingredient is clearly fresh, ripe tomatoes. Some supporting ingredients are used to give the soup a little more flair. Let me tell you how this tomato soup came about. It is a rather old story. It was years and years ago that my husband (then my boyfriend) and I were on our way to Hilton Head Island. To spend a week in a tennis camp, improving out tennis game. That was back in 1994, can you image 1994? We were living in Holland at that time and flew into Dulles Airport, rented a car and drove around Washington Baltimore area, Bill was showing me around the area where he grew up; his old school, his house etc. The following day we drove to Colonial Williamsburg, where we spent a few days there and then continued our journey to Hilton Head Island. The trip from Williamsburg to HH was nasty; heavy rains and low temperature. We didn’t think we were ever going to play tennis, but the following day the weather was absolutely gorgeous and so was the rest of the week. You will wonder most likely, why I remember this so well. Well 2 reasons; it was my first trip to Hilton Head Island, but it was also the time we learned that my father was diagnosed with brain cancer. It was surreal, being on a relaxing island with worries running through your mind. I know that many tennis balls were suffering, because every now and then I was hitting the living daylights out of them. Simply out of frustration and helplessness. Let’s talk about the tomato soup, a simple tomato soup, a very simple tomato soup. Upon arrival in Hilton Head I was cold, I felt miserable and was not really hungry. I knew I needed to eat something, something comforting and light. We stayed in a hotel, went to the restaurant and I ordered the tomato soup. And that’s all there is . It was an amazing tomato soup. I do remember I asked whether it was home-made and I knew I was going to try to make this myself one day. This is what I did and the first time I made it is the way I am still making it. I am not kidding you. The one. I should say most important thing to make this Fresh Summer Tomato Soup a success is buying/using ripe tomatoes. I usually buy tomatoes on the vine. Wash them, and split them roughly in half and roast half of them and cook the other half. The flavor of this soup comes from the tomatoes, so using half ripe tomatoes does not give you much. The next thing is to minimize the amount of water you use for making this soup. Water dilutes the flavor and since tomatoes contain a lot of liquid, you don’t need to add any. So this is what I do: wash all tomatoes and divide them in 2 piles. Dry one and cut them in half. Place those halves, cut side up on a baking sheet covered with parchment paper. Drizzle with olive oil, salt and pepper and bake 40-60 minutes in an oven of 400 degrees F.
The other pile of tomatoes, cut those in quarters, no need to dry them, the water that clings to the skin is enough. Place in a pot and cook for approx. 15-20 minutes (do not add water). Start cooking them on low heat, until you see some water released by the tomatoes, then increase the heat and cook until soft. The following step is to combine the two tomatoes batches. Place the bakes tomatoes in a large bowl and add the cooked tomatoes. Use a slotted spoon to transfer the tomatoes. Again, keep avoid adding liquid to the soup. Us a immersion mixer to obtain a smooth soup. Or if you have a blender, by all means use a blender. I have a small kitchen and don’t have many large kitchen appliances, so I use a immersion blender. When you’re done pulsing the immersion blender you will still find tiny hard pieces in the soup, coming from the core and the seeds of the tomatoes and that’s not a good thing. Maybe nutrition-wise it is, but to me it is a distracting texture, an annoying texture, something that shouldn’t be there. May be when you use a blender you can even pulverize these tiny specks. But just in case you can’t. This is the time-consuming part of the soup; pour the soup through a sieve. Make sure you get rid of these hard specks that distract your tongue from enjoying a velvety experience; an experience this Fresh Summer Tomato Soup can provide. This is time-consuming and requires some long lasting elbow grease, but it is absolutely worth it. Once you manged to get all the soup through the sieve, you will be happy to know that you’re basically done, other than adding some optics and introducing some other flavors. First things first, add salt and pepper to taste. Then add some basil and creme fraiche. Mix the basil into the soup, then divide the soup over bowls or plates and add a dollop of creme fraiche. Leave the dollop in the center or swirl it through the soup. 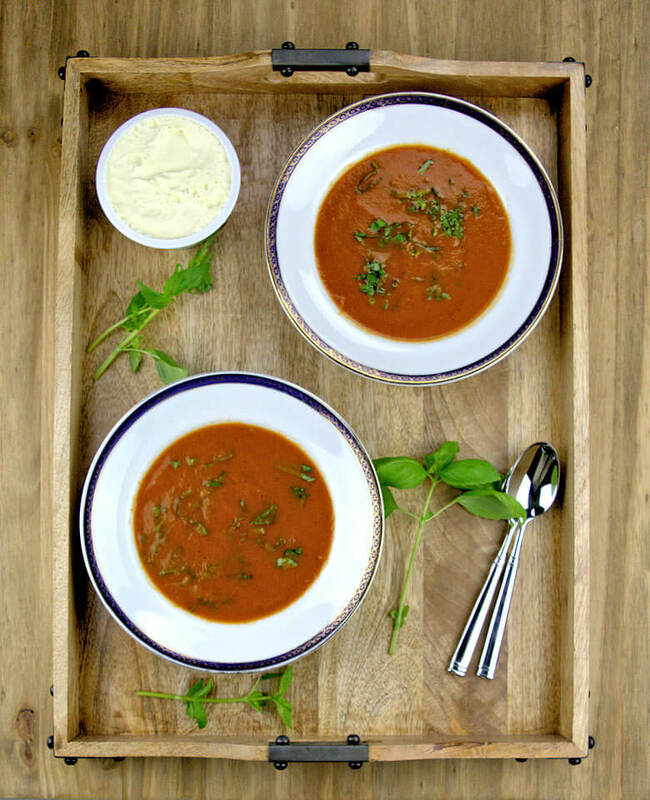 Sprinkle with some basil and you’re ready to serve this Fresh Summer Tomato Soup and enjoy! Preheat oven to 400 degrees F. Cover a baking sheet with parchment paper. Wash the tomatoes, Dry 2 lbs and cut the tomatoes in half. Place them on the baking sheet, cut side up. Sprinkle with salt and pepper and drizzle with olive oil. Roast in oven for approx. for 1 hour. Cut the 2.5 lbs. of the tomatoes in quarters (no need to dry them). Transfer tomatoes to a large pot and cook them on low heat until tomatoes release some of the liquids. Increase the heat and cook until tomatoes are soft. 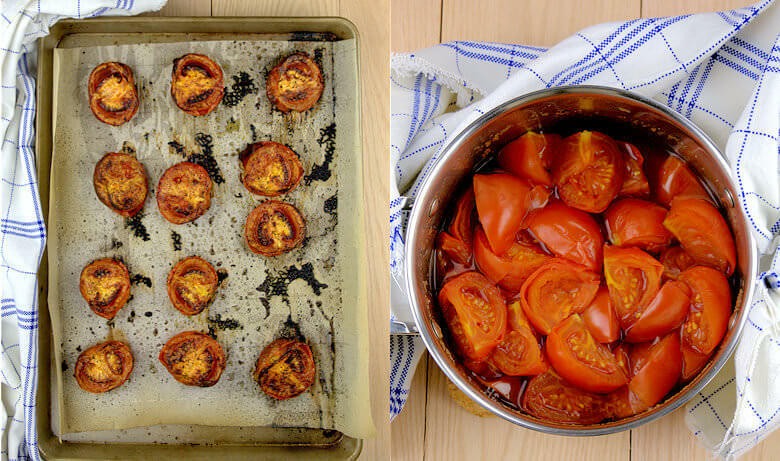 Transfer roasted tomatoes to a large pot and scoop cooked tomatoes into the same pot. Use a slotted spoon, so you only transfer minimal amounts of liquid. Use your immersion blender to create a smooth soup. You can also use a blender. Cut basil in fine shreds; use the chiffonade technique. Create a pile of basil leaves, one atop the next etc. Roll the leaves and then cut small strips. Add most of the basil over the soup and stir (leave some behind for garnish). Divide soup over 2 bowls or soup plates. Sprinkle with basil and add 1 tablespoon of creme fraiche to each plate. Leave it in the middle or swirl creme fraiche through the soup.